We began our journey during the season 2009 bringing interesting events, concert reviews and list of all concerts - of up and coming artistes as well senior vidwans. This set us apart from the other websites. With contributors who are three arts enthusiasts who share many skills amongst them – classical music, dance, writing, photography, audio & video techniques, blogging, driving, PR and so on, the website has been a one-stop reference for all those who look for a round up of all that is music, dance and arts in Chennai during December. Sivapriya Krishnan is an ardent and passionate singer, student and writer on Carnatic music. She is an MBA with a wide corporate experience in blue chip companies for 20 years and is also a faculty in business schools. In addition to this she holds an MA in Music from the Madras University and is completing a course in Human Resource Development and Training from Franklin Covey. 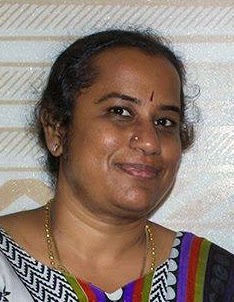 She has performed concerts and also enjoys teaching Carnatic vocal music to a few students. L. Baba Prasad, an accomplished mridhangam artiste is the son of Shri. Adyar K.Lakshman, a well-known Bharatha Natyam guru. Trained under Shri. 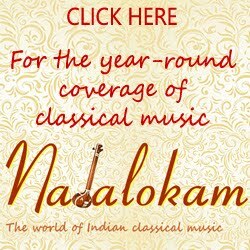 Vaidyanathan (Trivandrum) and later under Guru Shri Palghat Ramanathan of Kalakshetra, Baba Prasad learnt the special techniques of playing Mridangam for Bharatha Natyam from his uncle K. Gopinath. A sound engineer by profession and owns a digital sound studio, He also teaches recording, mixing and mastering to media students. Baba is a member of International Brotherhood of Magicians (U.S.A) and has performed Close-up magic shows in Singapore and India. R. Revathi loves classical art forms - Carnatic music and traditional Indian dance - and plays the veena. She writes freelance on arts and culture for magazines, newspapers and websites. With a background in finance, accountancy and writing, she practices and teaches Banking and Commerce at her free time. She holds a masters degree in Journalism and works with new media technologies, maintains websites and makes documentaries in her free time. 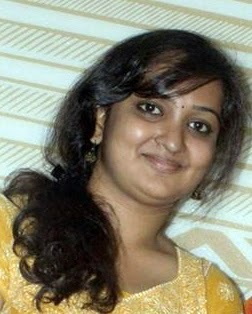 She motivates young people in writing and reporting through a dedicated website, based in Chennai. An aspiring Chartered Accountant and an avid photographer, Smita loves capturing moods of the performing artistes. A photography enthusiast who loves travelling across the length and breadth of the city to shoot. A viscom post graduate and an event manager. A multi talented with a variety of interests. The posts here will range from real reviews to light and off-beat stories; expert answers to fun quizzes; photos from all over – the stage, the canteen, the green room, the parking lot; awards & schedules.More and more ideas as they pour in and as the season takes off. Your feedback will encourage us! 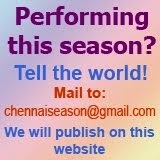 If you are in Chennai, you can also share with us what you experience. If you love to read about the season's happenings, please visit the website more than once a day and post your feedback by clicking on 'Post a comment' below the articles.